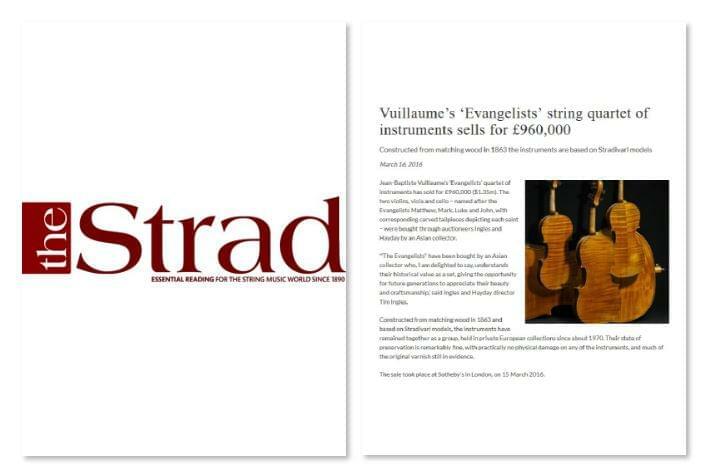 Jean-Baptiste Vuillaume’s ‘Evangelists’ quartet of instruments has sold for £960,000 ($1.35m). The two violins, viola and cello – named after the Evangelists Matthew, Mark, Luke and John, with corresponding carved tailpieces depicting each saint – were bought through auctioneers Ingles and Hayday by an Asian collector. ‘”The Evangelists” have been bought by an Asian collector who, I am delighted to say, understands their historical value as a set, giving the opportunity for future generations to appreciate their beauty and craftsmanship,’ said Ingles and Hayday director Tim Ingles. Constructed from matching wood in 1863 and based on Stradivari models, the instruments have remained together as a group, held in private European collections since about 1970. Their state of preservation is remarkably fine, with practically no physical damage on any of the instruments, and much of the original varnish still in evidence. The sale took place at Sotheby’s in London, on 15 March 2016.